In our La La Land video we touch on the many, many movies that influenced Damien Chazelle’s film. And now we want to shine a spotlight on two of the Jacques Demy musicals that inspired it -- starting with The Umbrellas of Cherbourg (1964). Chazelle has said that he’s watched this colorful, clever musical more than 200 times. It’s the story of a young couple, Guy and Geneviève, in a small French town during the late 1950s. Everything seems pretty blissful for a while, but then Guy is drafted to serve in the Algerian War and Geneviève discovers she’s pregnant with his baby. The Umbrellas of Cherbourg is experimental in form -- it’s part of the French New Wave, and it’s a play on classic MGM musicals. The costumes and scenes in this movie are total eye candy. And it has a beautifully bittersweet ending that will stay with you. So the next time you’re craving a poignant, delightful musical treat, check out The Umbrellas of Cherbourg. Then we recommend you follow it up with Demy’s next film, The Young Girls of Rochefort (1967). The film opens with a surreal dancing-in-traffic scene, which inspired La La Land's dancing-on-the-freeway opening. It has the same bright colors and whimsical tone as Umbrellas, but it’s less melancholy. The story follows twin sisters who look for love and dream of leaving their hometown behind to chase fame in Paris. It’s a burst of joyous fun, singing, and dancing, and it’s really the perfect pick-me-up movie. Both of these films are now out on the Criterion Collection. Buy The Umbrellas of Cherbourg on Criterion here. 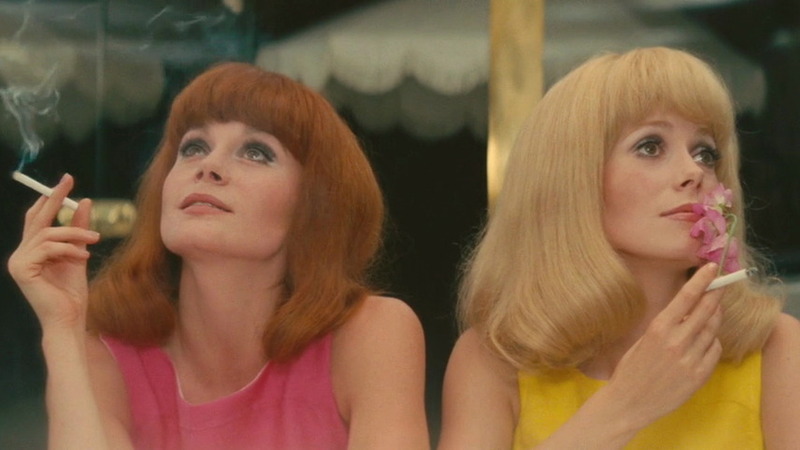 Buy The Young Girls of Rochefort on Criterion here.